Category 4 to 7 year olds. 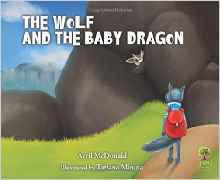 When Wolfgang and his friends learn about a secret cave where a baby dragon is growing they quickly run off to find it but, sadly, Wolfgang gets left behind. His bag is full of heavy worries that are making him slow and he just can’t let go of them. When he trips on a rock and falls, Spider shows him how to rest his busy mind and tells them that worries aren’t so bad if you share them. Nobody likes worries, so it’s good to know how to give a worried mind a rest! Avril McDonald has a Diploma of Education from Wellington College of Education, New Zealand, where she trained as a primary school teacher majoring in music and dance. She has had a varied career in digital entertainment. She launched Feel Brave to help teachers and parents find solutions to help children learn to deal with their emotions and to reach their potential. I lovely way to teach important life lessons.